13:25 and the stars will be falling from heaven, and the powers in the heavens will be shaken. 13:26 Then they will see ‘the Son of Man coming in clouds’ with great power and glory. 13:27 Then he will send out the angels, and gather his elect from the four winds, from the ends of the earth to the ends of heaven. 13:28 “From the fig tree learn its lesson: as soon as its branch becomes tender and puts forth its leaves, you know that summer is near. 13:29 So also, when you see these things taking place, you know that he is near, at the very gates. 13:30 Truly I tell you, this generation will not pass away until all these things have taken place. 13:32 “But about that day or hour no one knows, neither the angels in heaven, nor the Son, but only the Father. 13:33 Beware, keep alert; for you do not know when the time will come. 13:34 It is like a man going on a journey, when he leaves home and puts his slaves in charge, each with his work, and commands the doorkeeper to be on the watch. 13:36 or else he may find you asleep when he comes suddenly. 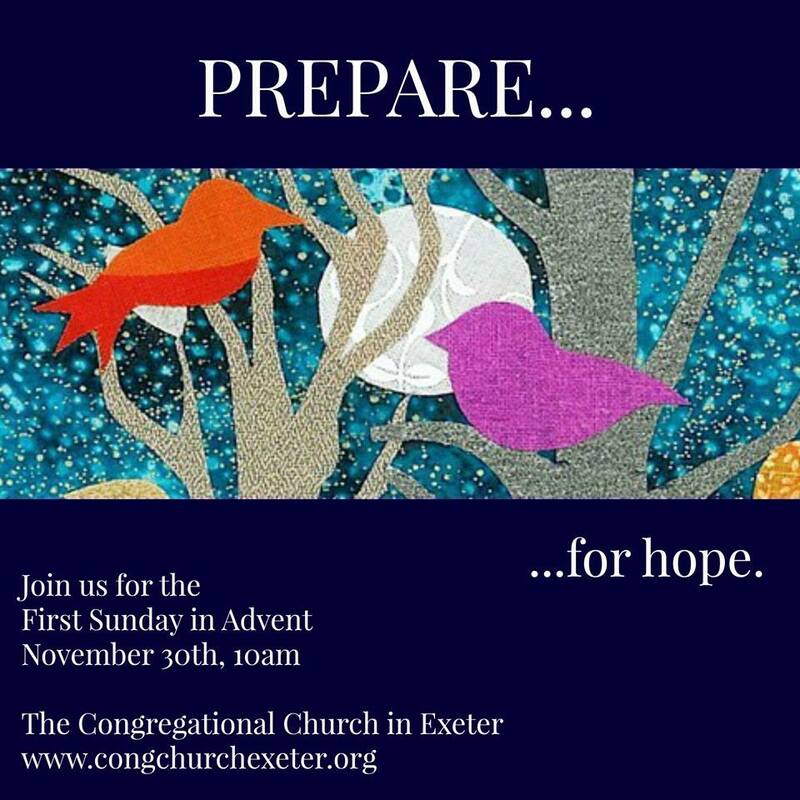 Today is the first Sunday in Advent, the start of the church season when we begin to prepare for Christmas, and the coming of Christ. And like I was telling the kids when they came up here this morning, our sanctuary shows that we are getting ready for something new. Our paraments have switched over from greens to blues and purples. The Advent wreath has been lit for the first time. And the manger is here, waiting for Jesus’ birth. And this first Sunday in Advent, like all the other Sundays in Advent, has a traditional meaning and theme. The first Sunday is focused on hope, and the next three on peace, joy, and love. And so over the course of this month, we are going to be thinking about those things and praying about them in the hopes that as we wait for Christ, hope, peace, joy, and love will surround us, and transform our world. And so, knowing that we are thinking about hope today, you might wonder why most churches are reading the particular passage from Scripture that was just read. Because, it doesn’t sound so hopeful. Listen to part of it again: Beware, keep alert; for you do not know when the time will come. It is like a man going on a journey, when he leaves home and puts his servants in charge, each with his work, and commands the doorkeeper to be on the watch. in the evening, or at midnight, or at cockcrow, or at dawn, or else he may find you asleep when he comes suddenly. And what I say to you I say to all: Keep awake. But then I think again. Because I don’t think that Jesus is the horrible boss hiding around the corner waiting to sneak up on us and catch us in the act. I don’t think Advent is about that at all. But, I do think that Advent is about waking up, and being prepared. But not because we are afraid. But because something big is about to happen, and God is behind it. And that’s because Christmas is a bit of a both/and holiday. It is both about something that happened 2,000 years ago, but it is also about something that is happening now. Because 2000 years ago Jesus was born in Bethlehem, and that alone is worth celebrating and remembering. But Christmas is more than just a historical event. Christmas is something that keeps happening in our lives. And each year this celebration can help us to remember that. Because Christmas is all about God becoming one of us. Not like one of us, or pretending to be one of us, but God choosing to be one of us. It’s God loving us so much that God came into the world not in power, or wealth, or prominence, but as a little child who had none of those things, and yet who changed everything. And it’s about the fact that God has never stopped being a part of our world. Christmas is about God breaking into this world, and God breaking into our hearts. And, in a strange way, Advent is the season where you and I help God get ready to do pull off the ultimate break-in. We do this by preparing ourselves to be the first to be broken into. And so, we unlock the doors of our hearts and minds, the ones we keep sealed up so much of the year out of fear, or anxiety, or pain, or hatred. We shut off the alarm systems that keep us on edge, and keep us from opening ourselves wide. And in this season, somehow, we find a way to be just a little more loving, just a little more joyous, and just a little more hopeful. And the hope comes where we least expect it. Because contrary to what the ads on television might tell you, hope does not come in a Black Friday or Cyber Monday sale, no matter how much you will save. Hope is not dependent on whether you get everything on your Christmas list this year, or even whether your kids do. It doesn’t even come from having the perfect Christmas cookies, or lights, or tree. Instead, the hope comes when God breaks into our hearts, the same hearts which are so often broken by this world. Because you can be the most positive and optimistic person in the world, and yet you have to admit that there is a lot in this world that can break your heart. So this year, how are you going to help God’s love to break into this broken world? How are you going to prepare for something better, not just for a few weeks every December, but for always? Our tradition in the UCC is fond of the phrase “God is still speaking…”, used to describe our belief that God is still revealing God’s self to us. But maybe a better phrase might be the odd sounding “God is still breaking and entering…” God is still breaking into our world, and entering our hearts. And thanks be to God, literally, for that. And so, where do we hope God’s love breaks into and enters this December? Afghanistan? Syria? Washington, DC? Ferguson, Missouri? I hope for all of those places. But before I can hope for any of those places, I have to first hope that God’s love breaks into my own heart, and changes me. I have to be ready to let God’s love do that. I have to be willing to be transformed. And I have to accept that fact that once God is in, everything is going to be different. I can’t hope and also cling to the way I want things to be all at the same time. Because if I want to choose God’s hope, I also have to choose to let go of what is comfortable, and certain, and easy. That’s true of all of us. That’s even true of God, who chose to become one of us, that came in a newborn’s weakness, in order that we might learn what it is to really hope. And so, on this first Sunday of Advent, we can choose to live into that hope. And we can choose to help to welcome Christ into this world by preparing a place for him that we have lined with our prayers. During the children’s sermon I was telling them that each week we are going to be doing just that, in a symbolic way. This manger has been brought to the chancel, and you have in your pews strips of yellow paper. You might not know it yet, but that’s straw. That is the straw that we are going to use to line this manger, and to get it ready for Jesus’ birth. So, here’s the interactive part of the sermon. And so, take a moment now. Take one of those strips of paper, and write your prayer for hope. It can be simple, just a few words. And in just a few minutes, as we sing our next hymn, the youngest members of our community are going to collect those prayers from you, and they are going to bring those hopes up to the front here, and lay them in the manger. And as they do, we will be singing a hymn that you have probably sung many times before, the classic hymn of Advent. “O Come, O Come Emmanuel”, which means, literally, “O come, O come, God-with-us”. It’s a prayer in itself. An invitation to God to break into our hearts, and to change everything this Advent. And so my first prayer of hope this Advent is for all of us, and that is that we will sing that hymn and mean it. It’s that we will be ready to ask God to come and change everything. And it is that we will hope. O Come, O Come, Emmanuel…we are ready for you. Amen.